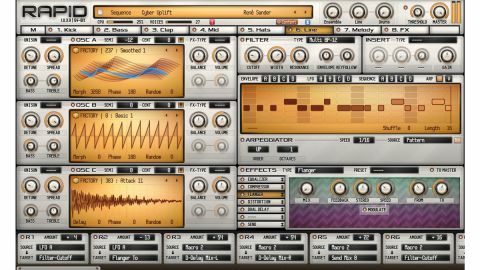 With a vast eight-layer architecture, brilliantly designed modulators and stunning library of wavetables and samples, Rapid sounds incredible and never gets overwhelming. Great library of waves, samples & presets. A few minor interface quirks. The first release from newcomer Parawave, Rapid (VST/AU) is clearly a direct competitor to Vengeance-Sound’s VPS Avenger, whether it means to be or not. Chief among the similarities between the two are that both are built on extensive eight-layer architectures (although Avenger actually has nine layers if you include its Drums oscillator); both feature enormous and expandable libraries of waveforms, samples and wavetables; and both have more modulation options and effects than most users will ever need. Rapid’s eight layers are accessed via the so-named tabs towards the top of the interface. Each one is effectively a complete synth in its own right, comprising three oscillators, a filter, a post-filter insert effect (which can be a second filter amongst other things), a full-on modulation system, an arpeggiator, and a seven-slot effects rack. How you bring the layers together is entirely up to you, but immense layered patches, composite multi-instruments (bass in one keyrange, pad in another, drums in four more, etc) and fully formed mini arrangements (each layer has a dedicated arp/sequencer, remember) are very much the order of the day. The far left tab leads to the Master page, which we discuss in Master of cermonies. Clicking the top of an oscillator display opens an overlaid browser from which you can select one of 260 wavetables or 196 multisamples as a source signal for that oscillator. As you’d expect, the vast majority of these are overtly synthetic in nature, but there are also a handful of acoustic and electric instruments in there, as well as some very respectable drum kits and kit element menus (all snares, all hi-hats, etc), ambiences, extended soundscapes and sound design ‘utilities’ (attacks, noises, etc). It’s a huge and diverse range of tones, shapes and instrumentation as it is, but this cavernous resource can be made more so by investing in Parawave’s Rapid Extensions, of which there’s currently only one in its online store. It’s called XT - Electronic Energy (€50), and it rolls in another 1.2GB of presets, wavetables and samples of a decidedly ‘big room’ flavour. Rapid’s modulation setup is enormous. Each layer features four LFOs, four envelopes and four step sequencers, all of them assignable to any of (only) that layer’s controls, including those of its loaded effects. You get 32 assignments per layer, using drag-and-drop or menu selection (via the target control itself, or in one of the 32 routing blocks at the bottom of the layer), and the same source can be assigned cumulatively to the same target multiple times, for modulation scaling and accelerating. The LFOs load two waveforms at a time from a lengthy list of standard and ‘designed’ shapes, with A and B Phase and Bend knobs shifting and skewing each wave, and the X-Fade knob morphing between them. The envelopes are ADSRs, with a Level control for the Attack stage and the ability to apply curvature to the Attack, Decay and Release stages. And the step sequencers are edited using a clever system whereby one of 20 preset curves is entered into each step, and dragging with the left and right mouse buttons adjusts the height of the left- and right-hand ends of the curve respectively. All of the modulators have their own preset libraries, to which you can add your own configurations. Finally, although the modulation sources in one layer can’t be routed to targets in another, the three Macro knobs at the top of the interface are global, assignable to as many controls from across the whole synth as you like. Scanning through wavetables is done with the Morph control, which becomes a Delay control for mutisamples, offsetting their triggering by up to 500ms, and is, of course, available as a modulation target. Four octaves of detune are on tap, as are up to eight detunable, spreadable unison voices, while Bass and Treble knobs allow quick frequency shaping of the oscillator output prior to filtering. The Phase control shifts the phase of a wavetable or start point of a multisample (although the lack of visual feedback for the last isn’t very helpful), and the phase or start point is randomisable, too, for the main and all unison voices. Each oscillators can also be shoved through one of eight transformative effects processors - tube and phase distortion, hard sync, noise, phase randomisation, and phase, pulse width and ring modulation - with the FX Amount and/or FX Factor knobs controlling one or two parameters of each (mod depth and pulse width for pulse width modulation, for example). The oscillator display shows each triggered multisample as a static waveform, and wavetables as animated 2D waveforms or full 3D representations with a blue ‘slice’ showing the current position within the ’table, and thus the shape of the waveform at any given point. The 3D view looks lovely, but we do wish it was a bit bigger. Wavetables can’t be edited, incidentally, as their equivalents can in Xfer Records Serum and Tone2 Icarus, and you can’t import your own samples yet, although we gather the latter is on the to-do list for a future update. Rapid’s filter offers 20 types: the usual 6, 12 and 24dB/octave low-pass and high-pass options, various band-passes, peaks and notches, a comb filter, and a set of specialised low-pass models: Acid, Vintage, Xtreme, etc. All but Comb have Cutoff and Resonance knobs, plus a third contextual control (Treble boost, Stereo balance or bandwidth, depending on the filter type), while Comb sports Cutoff, Damping and Feedback. The post-filter Insert effects take in various analogue-style and digital distortions (Tube, Overdrive, Bitcrusher, etc), a ring modulator, the stereo channel-delaying Time Lag, and a selection of ‘secondary’ 12dB/octave filters. To the left of the Layer tabs, the M tab flips the interface over to the Master page, which, as the name suggests, is where Rapid’s eight layers come together for mixing and keyzoning. It’s also where presets are loaded and a couple of synth-wide tweaks are made. The mixer doesn’t do anything beyond setting the levels for all layers - there’s no panning and no soloing, although at least layers can be muted by turning them off directly on their tabs. Below it, though, is a simple multiband compressor that proves to be much more useful than we expected. It has Threshold and Gain controls for each of its three bands, and eight presets governing the rest of its behaviour internally. It’s not a detailed dynamics processor, but as a quick patch enhancer, it’s surprisingly effective - and the input/output histogram is ace. The Keyzone Editor lets you set each layer’s note range by dragging the ends of its representative horizontal bar - a straightforward interface that makes light work of setting up stacks and splits. The global Amp and Filter envelopes (individual layers don’t have hardwired equivalents) modulate all eight amps and filters together, while the Cutoff and Resonance knobs offset the two parameters for all filters - handy for global shaping and sweeping. On the left of the Master page, the preset browser divides Rapid’s 650+ patches into descriptive folders, which are freely editable within Windows and OS X using their regular file browsers. As mentioned, the each layer is processed with a rack of up to seven effects, chosen from a fairly conventional list of 18 - Delay, Reverb, Phaser, EQ, Trancegate, Talker (formant filter), etc - all of excellent quality, and each packing its own short list of presets. The 19th module, Send, reveals a bank of knobs for routing the output of the layer to any or all of the other layers’ Effects racks, facilitating the construction of epic parallel-processed signal flows, and enabling one or more layers to be deployed as master effects racks. Last but not least, every layer includes the de rigeur arpeggiator/note sequencer. There are no surprises with this one - it’s a graphically edited arp with up to four octaves of range, seven directional modes (including Polyphonic for a new arpeggio with each note) and the ability to load MIDI files. Sonically, Rapid stands squarely in the same territory as its contemporaries: massive basses, hyperkinetic sequences and pads, punchy drums (individual, kits and sequenced loops), expressive leads, ear-catching plucks, intricate textures, wacky arps, and more. For big, bright, mix-blasting modern electronic sounds, there’s just nothing it can’t do, as the 650+ presets in the preset library forcefully prove. On the downside, the wave browser is laggy (and clumsy to navigate) on our MacBook Pro, and the tediously scrolling modulation routing lane feels archaic next to the matrices of most other current synths. The inability to load more than one of each effect type per layer sits at odds with Rapid’s otherwise ‘no limits’ ethos, too, and many of the ‘spinner’ controls really should be knobs (Oscillator Morph, Phase and Random, to name but three). Oh, and the online manual’s only half-finished - although this is made up for to some extent by the informative tooltips that pop up when the mouse pointer is hovered over any of the controls. VPS Avenger comparison to some sort of conclusion, that synth’s more ‘modular’, less compartmentalised architecture is unarguably more flexible and better equipped in terms of generally available effects, distortion and modulator types; but Rapid’s individual layers are ridiculously well furnished - 24 oscillators, 32 LFOs, envelopes and step sequencers, 56 effects slots... It’s also laced with interesting and novel touches, like the dual-wave LFOs, nifty step sequencer editing, and Master page envelopes and filter offset. As for which sounds better, they’re so close quality-wise that it really comes down to individual taste - we prefer Avenger, but not by a great margin, and possibly just because we’re more familiar with it. sonic credentials required, but despite its relative complexity, it manages to remain approachable and intuitive. A truly outstanding debut by Parawave.